Whether you’re brand new to fertility charting or familiar with it, this post is to help you understand how to read the Kindara charts. Kindara was created to store and help you visualize your data so that you can take control of your fertility. We hear from women daily on how keeping track of their menstrual cycles and help, has helped them reach their fertility goal and beyond. Let’s get started! First, we’ll start with the basic anatomy of a Kindara chart screen, then we’ll go into more details in the sections below. *Please note that vaginal sensation and certain types of custom data are only available with a Premium subscription. Menstruation and cervical fluid appear on the chart as colored bars. The default is for CF to show less fertile fluid as taller bars and more fertile fluid as shorter bars to follow the same pattern as BBT (see complete chart below), but this can be switched if you prefer. These bars indicate menstruation, whether or not cervical fluid was present that day, as well as what type (depending on the color) and volume (based on the height of the bar). By default, the cervical fluid axis displays less fertile (Menstruation and None) at the top and more fertile (Eggwhite and Watery) at the bottom. This is because, once the temperature spikes after ovulation, the CF bars generally rise also (see complete chart below), allowing you to visually confirm ovulation by using both of your primary fertility signs together instead of temperature alone. If you prefer, you can flip the orientation of these bars in the settings to show the more fertile fluid at the top and less fertile fluid at the bottom instead. Check out this Fertile Peaks and Fertile Valleys article to find out how. The Menstruation bars follow the same pattern: The lighter the flow, the higher the bars, so that’s why you’ll see the heavy-flow days have bars that are lower than the light-flow days. Temperatures are plotted on the graph and connected with solid lines. Anything marked as questionable will be gray and won’t connect to other temps (CD20 below). Coverlines can be added automatically or manually. Luteal phase count will start after the temperature shift is marked. Basal body temperature (BBT) is graphed on the chart as blue or purple dots and are connected by a solid line. If a temperature is marked as questionable, that temperature will appear as a gray dot and a dotted line will connect the days before and after the questionable temperature (see CD20 above, or CD9 in the completed chart below). The coverline is another great tool to help visualize the temperature shift. It can be added automatically after the cycle is over, or you can create one manually. Simply long-press to make the coverline appear, and then drag it where you’d like to place. If you change your mind, you can touch the coverline and drag it upwards and off the chart to remove it. The numbers inside the temperature points of the graph are the luteal phase count. They will only appear if a temperature shift is marked and can help keep track of the length of the luteal phase. This is especially helpful if you are trying to conceive and are in the 2-week wait (2WW) or if you are monitoring the luteal phase for abnormalities. Custom data fields provide a place to track aspects of your life and health regularly. Basic users can have up to 4 custom data fields with toggle input type; Premium users have unlimited fields with 6 input types available. 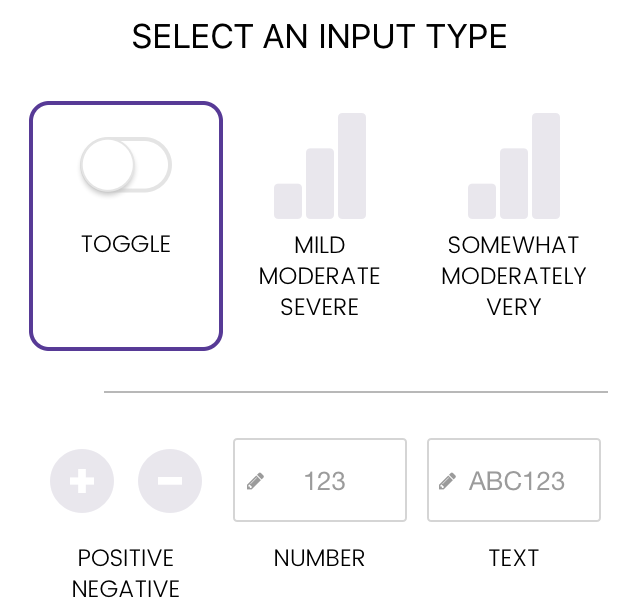 Use emojis to make toggle data easier to read and more fun! Journal entries are a great place to track notes or observations that won’t need monthly tracking or at-a-glance access. Number and text fields display a dot to indicate that the field has an entry. Emojis can be used in the text entry or as the name of a custom data field. If an emoji is set as the name of a toggle field, the emoji will appear in the chart like the wine glass emoji above; otherwise, toggles appear as dots. Once created, custom data fields will carry over to future cycles unless it’s deleted. Deleting a custom data field won’t affect previous charts, though, so the history of that field will be saved. You can also rearrange the custom data fields in the current and future cycles without affecting the previous charts. In conjunction with the custom data fields, the Journal is the perfect way to record observations or notes that won’t need to be recorded each month but that you may want to refer back to or that may affect your data for that day or that cycle. For example, you might want to make a note in the journal that you were traveling or ill, or even if you were particularly stressed, which can affect when and how often you ovulate. When all of these signs are charted together, a more complete and informative picture of your fertility and health in general may be formed. 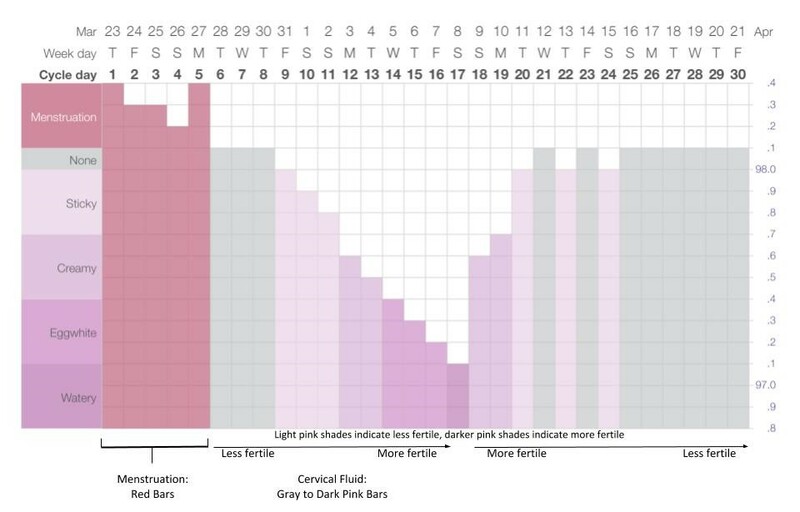 You can see in this completed chart why the default is to show low CF bars as more fertile: doing so follows the same pattern as BBT and helps confirm ovulation with both primary signs. CF bars will all appear gray on the 5th day after Peak Day if it is marked. If you mark a temperature shift and a peak day, all following CF will appear as gray bars in the chart following those events, even if it’s normally displayed as pink. 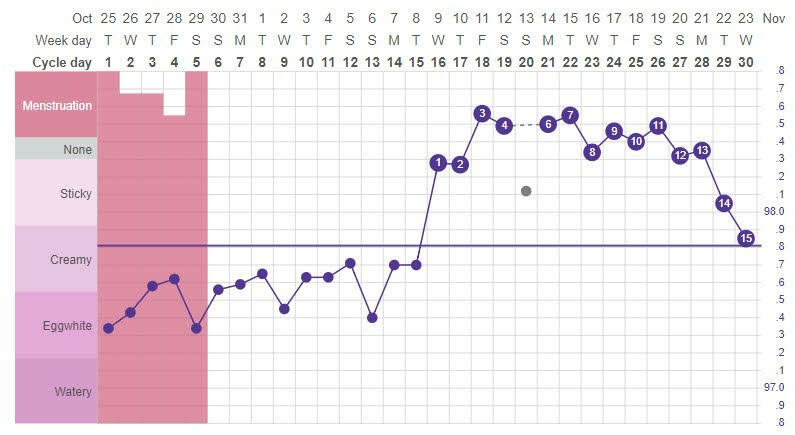 This is to help visualize the the infertile days after ovulation (assuming those temperature and peak day are marked correctly). If any spotting is entered, that will show on the bottom of the chart as red dots (CD27 and CD28, above). Some options shown in the example above are Premium features. Kindara Basic is ad-free and offers all the features that are absolutely necessary for charting: BBT, cervical fluid, temp shift, etc. In general, the goal can still be accomplished using only the basic features. Kindara Premium features, like unlimited custom data and special input types, direct messaging with other users, and private groups, would enhance your experience if you want to create a more detailed record of your health and engage further with the community. Regardless of if you are a Kindara Basic or Premium user, we are happy you are joining us! Our community is an amazing, supportive group, and people tell us that they’ve formed strong bonds through our app while traveling their fertility journeys together. We love that! Everybody is different, so no chart will look exactly the same, from person to person, or even from cycle to cycle for the same person. For those with regular cycles, their charts will follow the same basic pattern, but for those with more complicated cycles (like polycystic ovarian syndrome), the charts will look different. Check out Kindara’s Chart Gallery for more examples of charts. The community is a great place to get answers to many of your questions about your chart and you can share any concerns with your healthcare providor. We hope this was a helpful introduction! If you still have questions, please check out our Knowledge Base for more helpful hints on making the most of Kindara, ask the community, or ask us directly.